DEISIGN: Back from Angoulême International Comics Festival. Back from Angoulême International Comics Festival. 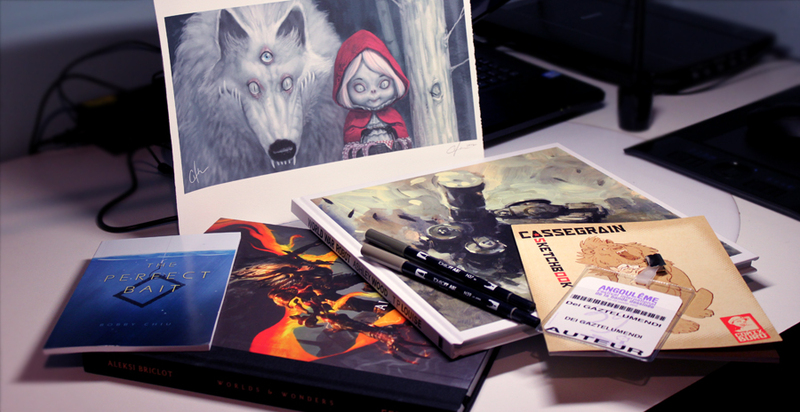 The Perfect Bait and a cool print by Bobby Chiu (It surely will be an interesting read). Aleksi Bricolt's Worlds & Wonders. (Despite the book being an awesome enough catch by itself, Aleksi drew me a really badass sketch to go with it... just great). Ashley Wood's World War Robot. (Muddy, rusty and delicious). A couple of Japanese TOMBOW ABT "marker-brushes" (Saw Aleksi using these and had to get myself a pair. Hopefully they work as graciously in my hand). A Comix Buro Sketchbook by artist Didier Cassegrain (An awesome new discovery). Some of you might be surprised at the absence of a single comic book here... Fair enough. But as you can see from the list above, this is the shopping cart of an Illustrator and a Character Designer at heart, not a Comic Book Artist. As much as I enjoy some comic book geniuses (Moebius, Guarnido, Bernet, Mignola,...) I know my place and succumbed to my true instincts as a worshiper of the sole image. Bonne nuit and thanks for stopping by.